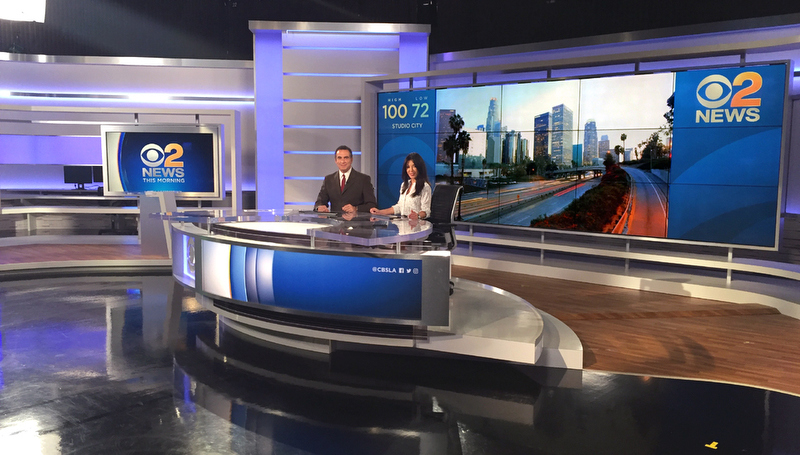 KCBS-TV, the CBS O&O in Los Angeles, has debuted a new set from Broadcast Design International that combines a light and airy feel with strong structural elements, marking the first change for the station in nearly 10 years. The centerpiece of the set is a gently curving anchor desk framed with thick silvery frame that houses a glassy dimensional logo and two large video walls. The walls, which in a 5×3 and 3×3 array, are made up of Primeview 55″ IPS LED LCD monitors, specifically designed for video wall configurations. 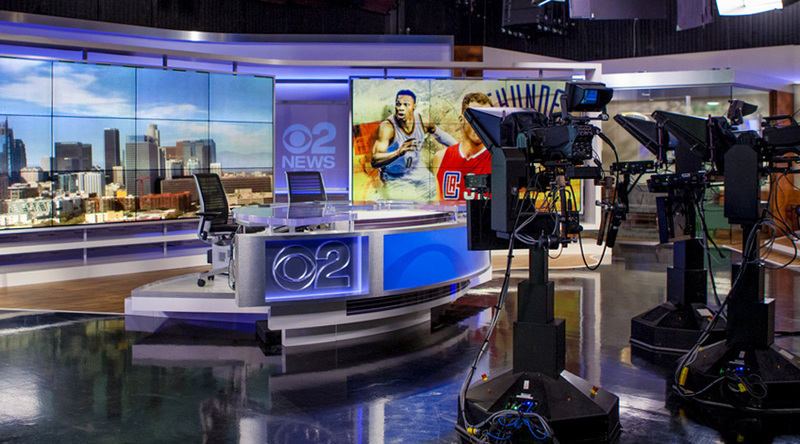 Separating the two walls, an etched CBS 2 News logo serves as a transition element. Vizrt’s Viz Engine powers the two large video walls. Camera left of the anchor desk is divider wall, created from color changing panels and grey wall pieces. 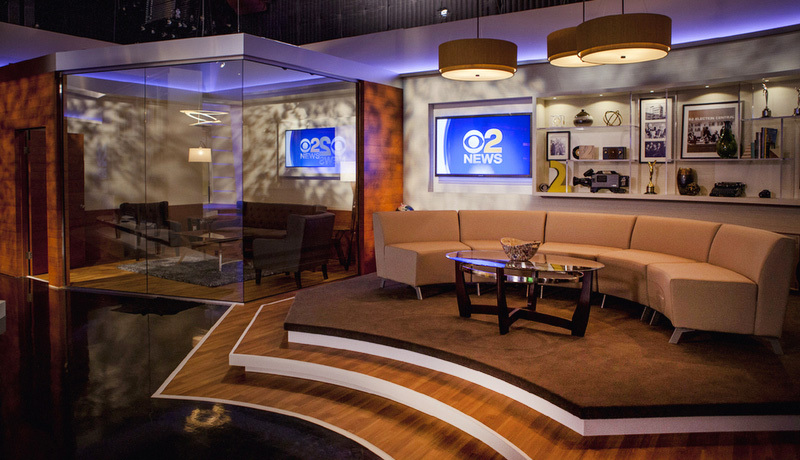 In a lighting touch, a textured gobo prevents the wall from coming across as too flat or cold on-air. Next to this wall is the weather center, which is framed with another thick structural element. Here, however, much of the space in the middle of the frame is left open, looking onto the work area behind, which has a back wall with a color changing ribbon along with accent lighting and a faux stacked stone knee wall. One side of the frame houses a large horizontally mounted flat screen that’s designed to be shot from the lectern-type presentation pod strategically placed in one corner of the riser, which featured a medium wood tone. An additional 82″ flatscreen is mounted to the other side and is also designed to be shot from both the lectern as well as a single, straight on one shot. This touch enabled monitor is designed for use by traffic and social media presentations. The set also boasts an interview area that’s outfitted with lighter grays and more medium wood tones. Open shelves placed next to a wall mounted flat screen include knickknacks from the stations history, while three drum-style lighting fixtures are suspended above the curved sofa. Like the tall wall on the main set, textured gobos are used extensively through the interview area — and especially inside the “green room” to soften the look. 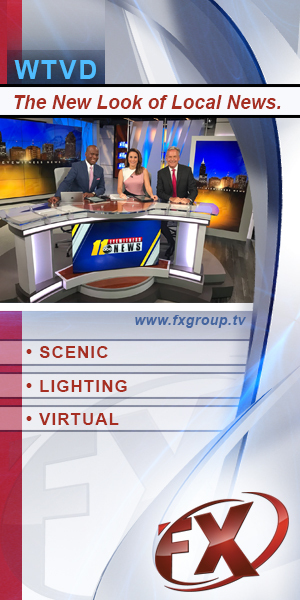 Overall, the set uses metal surfaces and bright color changing elements to give the studio a fresh vibe and a new look for the station. The plentiful monitors provide more than just cityscapes, with integration of graphics, allowing for a unique presentation element on-air.